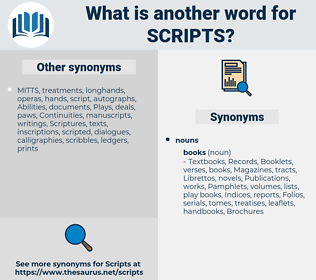 What is another word for scripts? 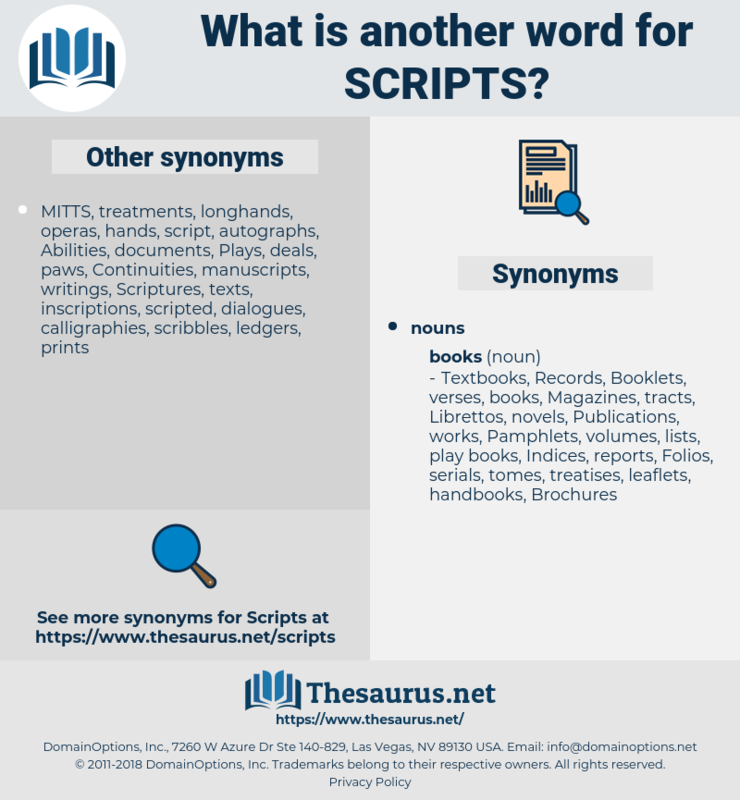 manuscripts, screenplays, transcriptions, transcripts, Descriptors, descriptions, scenarios, alphabets. instructions, letters, Characters, pictures, characteristics, productions, Languages, writings, provisions, write, specifications, parts, narratives, projections, Advertisements, papers, scrolls, Stories, postings, paintings, archives, directions, liabilities, drafts, formulations, pieces, creations, strings, documents, threads, roadmaps, Directories, contributions, Possibilities, spots, patterns, wordings, utterances, alternatives, playbooks, rails, legislations, CPDS, submissions, artworks, stipulations, instruments, materials, schemes, disclosures, SPARES, Respondents, acts, Clips, text, texts, profiles, lyrics, situations, responses, Pleadings, statements, textes, variants, suites, features, announcements, stretches, by-laws, fonts, scenes, Textbooks, vouchers, components, repeats, issuances, successions, SPDS, streaming, simulations, outcomes, Selections, rooms, variations, options, Guidebooks, attachments, traits, laws, indents, Records, messages, enactments, Essays, Replies, PATHWAYS, timelines, Tracks, Coins, files, Entries, e-mails, digits, ADS, statutes, works, footnotes, banknotes, memos, commandos, futures, streams, guides, Emails, Filings, manuals, handbooks, sets, grades, dashes, exhibits. screenwriters, Scriptures, writers, sequences, hyphens, notes, Plays. servitude, Sure-footed, sauropoda, sorbed, shrovetide, scarabaeidae, scarf out, scrubbed, sherbet, serfhood, serviette, surfeited, sharp-eyed, scraped, shrift, square foot, scrub beefwood, surfboat, sorbate, sorbet, surefooted, scarabaeid, sugar beet, scripted, shower bath, sgraffito, sharp-toothed, surfeit, sauropod.